Writing can be a difficult career. Writers can be lonely, plagued by self-doubt, faced with rejections that feel personal and judgmental, and expected to be good at everything (creative and a sales/marketing person!). Not to mention that we also struggle with balancing procrastination and never taking a day off. Yet we do it anyway. We must have our reasons…beyond sheer insanity, I mean. Every once in a while, it’s good to step back and consciously recognize why we go through all of those struggles. That’s why when my friend Kerry Gans asked if I would join the My Writing Process Blog Tour, I said yes. The My Writing Process Blog Tour is a blog hop with new locations each week for writers to talk about their writing process. Read all of the way to the end of today’s post to see how you can participate. I was nominated for this blog tour by Kerry Gans, so let me take a minute for introductions. Make sure to check out her answers to the My Writing Process Blog Tour here. 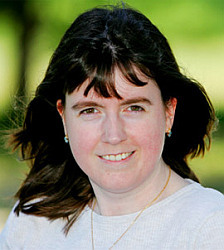 Kerry Gans writes middle grade and young adult fiction. Her debut novel OZCILLATION is coming out in 2015, and she has had two short stories published. She can be found ruminating on the writing life on her personal blog The Goose’s Quill, and her group blog The Author Chronicles. The bulk of Kerry’s time is spent pursuing her most important Work-In-Progress, her preschool daughter. It might be easier to say what I’m not working on. As I mentioned last week, I’m recovering from a severe injury to my ankle that has me in a wheelchair and focused on several-times-a-day physical therapy. So circumstances have slowed me down by necessity and various self-imposed deadlines have slipped. Writing-wise, I’m mostly working on editing, editing, and more editing. I have a short story and three novels I need to get into shape. At the same time, I’m trying to learn All. The. Things. for a new project. So yeah, going in a bazillion directions at once would be an accurate description. Let’s just say that I’m glad my day job should be calming down for the next month or two. Maybe I’ll even be able to dig out from the avalanche of email. *eyes 4000+ messages in my inbox* Or not. Believe it or not, I struggle with this question, and maybe many writers do. I write paranormal romance, and that genre typically balances romance and paranormal worldbuilding with a strong external plot (battling a villain, saving the world, etc). So what do I think makes my stories different? In a word, my characters. I let my characters be strong and vulnerable in unique ways. Unlike most paranormal romances, where the couple is often made up of a non-human, uber-alpha-male hero (also known as alpha-holes for their a**hole-like arrogance) and a human heroine who’s trying to measure up, I break stereotypes. I have a shapeshifting dragon heroine who’s stronger than the human hero—but she’s also a pacifist who’s taken a vow of non-violence. My heroes aren’t alpha-holes and even have a few beta traits—but one is also a murderer (yeah, imagine the struggle to make that character likable). I let my characters be broken and messy because that’s how real people are, and I strive for honest emotions in their relationship. They screw up and they call each other on it. They don’t tiptoe around difficult issues. I’m proud of them by the end of each story. It’s a cliché, but I write the kinds of stories I want to read. I get frustrated during the editing process like any writer, but when I’m done, I love my story more than ever. I want to write stories that would sit on my “favorites” shelf. I write romance because I believe that love is the most powerful, most transformative, most redemptive force in the universe. We’re all broken and messy, but we all can become better and deserve happiness, and the need for love and connection often drives that change. I write paranormal because the fantasy aspects of the world allow me to explore topics and plots I couldn’t in straight contemporary. Throughout history, stories from Aesop’s fables to Animal Farm have used non-real elements to connect with readers, and I see paranormal along the same lines. Plus, as a reader, I find myself more sucked in by stories with deep worldbuilding. But mostly I write these stories because I love the characters. Like I mentioned above, I’m proud of them by the end of their story, and I’m hoping I’ll get to share my stories with readers soon. I’m a pantser, which means I write by the seat of my pants and often have no idea where my story is going. Luckily, my subconscious/muse knows what he’s doing, and I credit him for all good ideas. (Yes, my muse is male.) My characters regularly surprise me by doing something I wouldn’t have consciously thought of in a million years. Hmm, you want more explanation? All right, every story is different, but I usually start with the characters. In my current series, each story idea has started with two characters who logically should never be together (in fact, they probably should be enemies), and I tag along as they discover love anyway. My knowledge of story structure means I do end up with a story at the end of my pantsing, and while I’m a slow writer, I write clean drafts. That might sound great, but that decent first draft also means that I have a hard time seeing how the story could be better. Thank goodness for beta readers! Acknowledge the person and the site who invited you into the tour (that’d be me and you’d link back to this post). Let me know in the comments if you’re going to participate so I can add your link to this post. Do you sometimes question whether the struggles of writing are worth it? Does it help if you step back and answer questions like these that remind you of why you write? 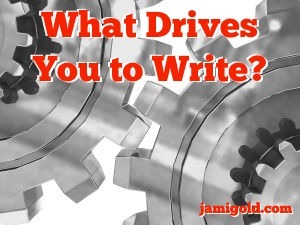 What drives you to write? Have you already participated in this tour (feel free to link to your post in your comment)? Or do you want to participate next week? I don’t ever question if writing’s worth it, because I figured out years ago that writing is good for me (as long as it isn’t keeping a diary, which interfered with my dissociation/suppression of memory and thereby led to blowups that, well, don’t help matters, with my family). Yes, I can’t imagine not writing, but I still find revisiting my “mission statement”-type reasons affirming. 🙂 Thanks for the comment! Sounds like fun! I’ll post next week. Events like these force me to reflect and articulate about myself as a professional, something that can go out the window when I’m logging hours writing by myself. Thanks for the open invitation. Yes, that’s exactly how I look at exercises like this too. 🙂 Every once in a while, it’s good to look up from our words and see (and articulate) the bigger picture. Yay! for joining in. I’ve updated the post with your blog link. Hopefully my tag for you is close to accurate. 😉 Thanks for the comment! I understand how wanting to see our characters get their happy ending can drive us to write. Like I said in the post, love of my characters is a big reason for me too. You know I’m all for you delving more into romance. Hee. Come to the romance side, my friend. 😉 And oh, your mention about atypical beauty works for my stories too. One of my heroines is beautiful in an inhuman way, but part of her magic produces a false image for her (like a magic “glamour”). The hero sees through it, but he’s the only one. So there’s subtext there that although she’s beautiful, that’s not why he’s with her because everyone else sees her as plain and isn’t impressed. And one of my heroes is definitely not the typical cover model look–he has dreadlocks. I like stories that mix dark and humor too, and I tend to do that in my stories as well. I wouldn’t call mine horror in any way, but the dark can get pretty dark. And yeah, it’s really hard to explain our pantsing “process.” LOL! Thanks so much for sharing! Oh about the dark and the light, I was chatting with a friend on Facebook, and I clarified it more for myself. My story has three main types of plots, the horror/ adventure plot, the friendship plots (development of friendships between the main characters), and the romance plots (of the three main couples.) The horror/ adventure plot is of the horror genre, and the friendship and romance plots are of the comedy genre. All three types of plots are equally important to the novel, so the comedy and horror are equally important to my story, lol. But it does get more complicated when you see that the friendships and romances develop even during the dark adventure/ horror parts, haha. Ooo, yes, dark times can often bring people together, so I can see that working in your story. Good luck with it! 🙂 Thanks for the comment! 😀 Just want to add an unrelated comment: I find that your scene elements post is also very helpful for me to see “hidden potentials” in my scene that I can develop to make it stronger. For instance, I can see a tiny bit of a conflict going on, but I can expand on this conflict, maybe even show the emotional effects of the conflict on the characters, etc. so that this conflict becomes more obvious and magnified. Similarly, character backstory, motivation, and goals could be made clearer. Of course we shouldn’t get too carried away with these “magnifications”, but it looks like a good way to see specific things we can work on to make a scene more effective and interesting. Yay! That’s awesome. Yes, we can always take the strong parts of our story and make them even stronger. 🙂 Thanks for letting me know! You’re welcome! And I just realized another HUGE reason why I keep writing. It’s because I think my main couple is very romantic. Their romance FEELS SO GOOD that I want to keep seeing what happens to them, how their relationship deepens and how sweet it will continue to be, etc. LOL! I understand. Yes, I want to see how my couples will find their Happily Ever After as well. 🙂 Thanks for the comment! My process is always evolving but my mantra for 2014 is “Never Too Late” and part of that means being willing to dive into new things. I had kind of a burgeoning career crisis this month, and my birthday and Mother’s day back to back didn’t help my uneasiness, but I’ve come too far to quit, and hard as it is sometimes, I don’t want to quit. This is the only thing I’ve stuck with this long since my previous ambitions to be a chef. I still love cooking and food, but I can’t be what a modern chef is now, I don’t want to walk away from publishing the same way. Yay! I had a feeling you might join in. 🙂 When you get your post up next week, let me know the permalink and I’ll update your listing in the post here. That’s awesome that you’ve pulled through a difficult month. Here’s hoping for smoother sailing for you in the future. 🙂 Thanks for the comment! Hope it’s easy to read. Great! I’ve updated this post with the direct link. 🙂 Thanks for participating! That was good to read! I admire you for how many novels and stories AND other stuff you handle at one time! I have more than enough on my hand with my normal writing job, one novel and the editing of another novel… still, ideas fight in my head for attention. Your heroine sounds awesome. I love strong female characters and I can’t stand alphas that are only muscle and ego, although I do write about men who SEEM to be in control. You have dragons in your story! *high five* One features in my upcoming novel “Playing with Fire”, although it’s only “sort of” a dragon. I think, in a way, we all write what we want to read… at least we shouldn’t only write what we think others want to read, because the story IS us to a degree. I was tagged by a friend some weeks ago to participate in the “My Writing Process” blog tour. These things are fun, and I love reading about other writers. And I think you’re right–if we weren’t writing what we wanted to read, that would be bad sign. Maybe the author would be looking for shortcuts to money trends, but they wouldn’t be true to themselves. this is a smashing idea and I’d love to try my hand at it, so please count me in. I really enjoy your blog by the way, great advice and also a dose of perspective when I need it. LOL! at your take on the heroes of too many stories. Yeah, I’m not big into angst. That’s why so many YA and NA don’t work for me. So much is pointless angst to me. Would you believe that I’m an uber-planner in the rest of my life? (Seriously, you should see how I prep for a trip. *shakes head*) But for writing I have to be a pantser because otherwise, that “uber” aspect takes over and doesn’t want me to go with the story flow. I pants so the story flow can take precedence. That said, sometimes I lightly plan more than other times. 😉 The holes that make me nervous are different for each story. Ooo, love that answer about imagination and sense of wonder. I very much relate. And your heroine sounds awesome. 😀 Thanks for the comment and the kind words about my blog! Oh noes! I’ve been like swamped with the day job and other craziness. Sorry top hear about the ankle! Hope it’s doing better. At least blog tours don’t require travel! Thanks so much for this! It’s something we don’t consciously think about too often. You got it in this week, so you’re all good. I updated the post with your link too. 🙂 Thanks for participating! The “My Writing Process” Blog Tour, AKA: What Drives Me To Write? | N.E.E.K.